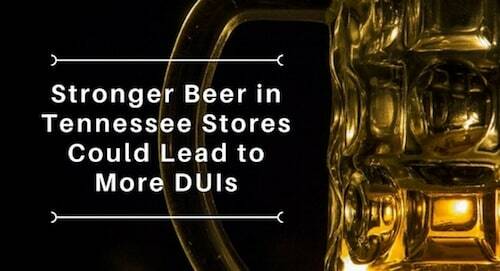 Tennessee breweries and grocery stores have long been restricted in the types of alcohol they can produce or sell. This meant that beers had to be around 6.2 percent alcohol by volume (ABV). With the 2016 passage of a new law that redefines beer, however, this level will change to about 10.1 percent ABV. While you may be looking forward to this, stronger beer in The Volunteer State could lead to increased DUI charges if you don’t drink responsibly. Tennessee breweries are excited about the idea of creating new and unique beers. Many alcohol consumers are also looking forward to purchasing novel brews from local vendors. One need only look at the increased ABV, however, to recognize that these new beers won’t be what you’re used to. While some may see it as a positive, these more alcoholic beers mean you’ll have to drink less to reach the same “buzz” – or level of inebriation. Unfortunately, this means you could potentially surpass the legal driving limit by drinking an amount of beer that previously had little effect on you. If you’re out on the road and don’t realize the effect these newer brews are having on you, it may only be a matter of time before you’re pulled over and charged with driving under the influence. Even though you’re now able to buy beer with higher alcohol volumes, it doesn’t change the DUI laws already in effect in Tennessee. If police pull you over, you have to submit to a blood alcohol content (BAC) test or risk losing your license for years. If your BAC is over .08 percent, you will be arrested and taken to jail. If convicted of a DUI offense, you can face nearly a year in jail, license revocation, alcohol treatment programs, up to $1,500 in fines and a variety of other penalties. Each of these punitive measures can occur on your first DUI conviction. For subsequent DUI convictions, you could end up losing your license for 10 years, face minimum sentences of nearly five months in jail, lose your vehicle and, in some cases, even be charged with a felony. Even a first-time DUI conviction in Tennessee can result in serious problems for your work, education and family life. Losing your license and having a conviction on your record has serious implications. This means you need to seek out legal help as soon as possible after being arrested. If you’re facing a DUI charge in Nashville, Tennessee, contact the Law Office of Bernie McEvoy today. Other factors could lead to even more serious penalties than the ones mentioned above, so you need all the help you can get at avoiding a conviction.